18 May Jo tells us about her amazing wedding. 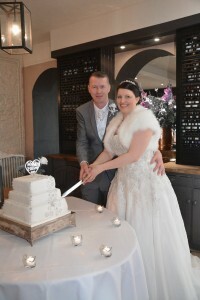 The dress designer was Justin Alexander 8738, we got married on 27th March 2016 (Easter Sunday) at the Bay Tree Hotel in Burford Oxfordshire. My colour scheme was cadbury purple and silver (to go with the Easter weekend) we even had mini eggs as our wedding favors. My Creatiques experience was amazing from start to finish. 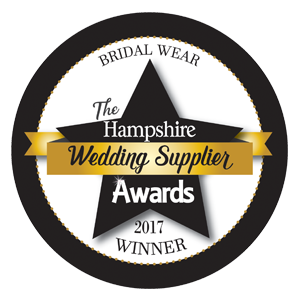 My family are from Portsmouth and I was looking through The NEWS, newspaper and I came across an article where you had won some awards and thought the boutique looked really nice then I booked my appointment and went along with my Sister Karen. I was seen my Rob who was great and very patient with me until I found my ‘perfect’ dress. 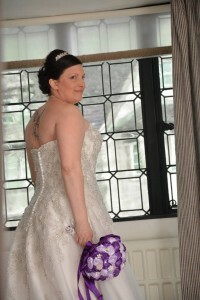 We also had a dress fitting with Kayleigh who also made us feel at ease. I knew I had the right dress at the fitting because I had brought along my 12 year old daughter and my Nan of 93 and when I came out of the dressing room they both had a tear in their eye! bless! So guys thank you so much at Creatiques you were amazing and I couldn’t have asked for more! Everything on the day went according to plan and I wouldn’t have changed a thing.